If you’re a returned visitor to our website today, you’ll see a completely different layout and design. With weeks of hard work, we’ve now made immigrationroad.com fully responsive. What it means is that whether you’re using a smartphone, a tablet or a desktop/laptop computer, you will have the same viewing experience because the website automatically adapts to your screen’s size: No more need to zoom and drag just to read the entire page. It is also compatible with all modern browsers including Google Chrome, Safari, Firefox and IE 9+, and will display beautifully on Windows, iOS or Android devices. Your favorite tools all remain intact. 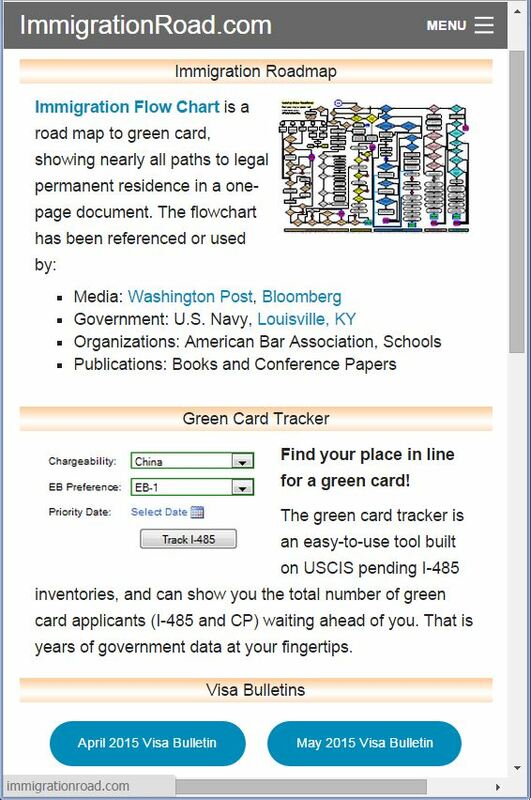 The green card tracker, visa bulletin toolbox and immigration flow chart all function exactly the same as before. Having said all this, I personally will miss our old website. After all, I designed it from the ground up and wrote every line of code to make it beautiful, clean and functional. But things have changed. Nowadays a significant portion of our visitors come through a phone or pad, so we have to adapt too. I hope you like the new design, especially if you’re a mobile user. And if you do see a glitch or have a suggestion, please don’t hesitate to let us know.